Italy is a great country to visit and there is no shortage of beautiful places to visit or interesting things to see. However, there are a few things to know before you venture out into Italy's cities and towns. Tourists frequently make small mistakes that can wreck their vacation because they don't know any better and don't do their research. So if you want to order a coffee, intend to ride a train or pack shorts because you're visiting Italy in the summer, be prepared by getting familiar with some of the local customs and rules. 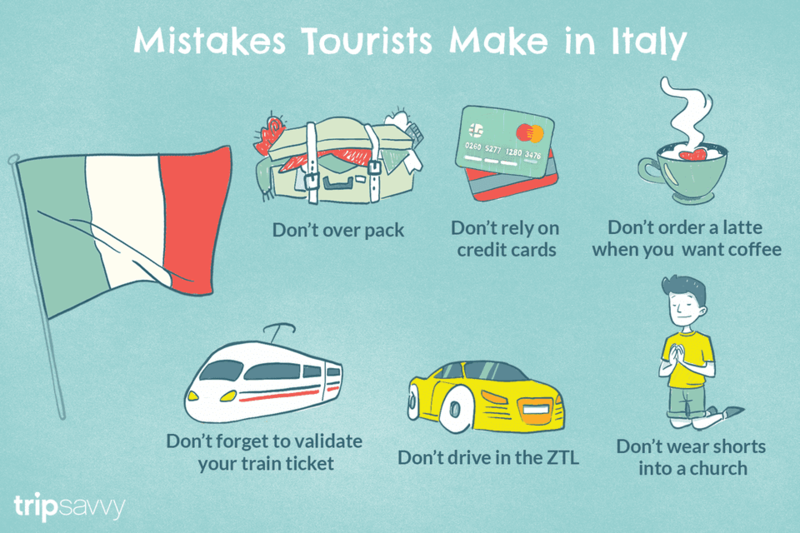 Here are the top 10 mistakes tourists make when they visit Italy. Tickets for regional trains, or any ticket that doesn't have a specific time and assigned seat, needs to be validated (Frecce train tickets, which have assigned times and seats are among the exceptions). Regional train tickets can generally be used on any train in a two-month period, so validate your ticket before boarding. All you need to do is find a validation machine; green and white in some stations and yellow in others. Push your ticket into the slot until you hear the stamp applied. This stamp will make your ticket good for up to six hours. Be warned that even tourists will get fined for not validating their tickets before boarding a train in Italy. Latte is the Italian word for milk, so if you order a latte, especially outside tourist areas, you may end up with a glass of milk. If you want a coffee, head to a bar (which in Italy is not just a place to consume alcohol). Keep in mind that in many places you will pay extra for table service. If you just want a quick coffee, do as the Italians do and stand at the bar. In restaurants, coffee (usually espresso) is normally served only after the meal (including dessert) is finished. Italians don't drink coffee with their meals and they generally don't drink cappuccino after noon, although you can still ask for one. Be advised you won't get free refills on your soda or iced tea and usually your cold drinks won't be served over ice. The ZTL, zona traffic limitation or limited traffic zone, is off limits to drivers who don't have a permit (which tourists aren't eligible for). Most cities and towns have a ZTL, which may also be called a Pedestrian Zone. The Centro Storico is usually a limited traffic area. Often a camera is posted at the entrance to a ZTL, taking photos of license plates as cars enter. It's unlikely that you'll be pulled over immediately but people have reported getting a ticket in the mail six months or a year later (often through your rental car company). Be on the lookout for speed cameras as you drive around Italy, as well. During high season, people may stand in line for an hour or two just to buy tickets to get into one of Italy's top sights or museums. These days it's pretty easy to buy tickets for most places online, although it will require planning your itinerary in advance. While you may not want to be tied down to a strict schedule there are some tickets you really should buy ahead of time. Italian cathedrals and churches are interesting to visit and many hold important works of art. You may find that most have signs posted asking visitors not to enter wearing shorts or with bare shoulders (for the most part, Europeans don't wear shorts, at least not as frequently as Americans do). Women can carry around a scarf to cover bare shoulders when wearing sleeveless tops. But many places, including the Vatican, will not admit people wearing shorts. So plan your dress to go with your sightseeing. In Italy, there are many places that still do not take credit cards and if you're traveling with American Express you'll find even fewer places to use it. Many small family-run restaurants and shops, bed and breakfast inns, and outdoor markets require cash payments. Your credit card may not work in machines such as the autostrada toll booth. It's a good idea to have two credit cards so you can use one as back up and be sure to call your banks before you leave to tell them the dates you'll be in Italy. Traveler's checks are rarely used for getting cash in Italy and if you do find a place to change them, you are likely to pay a fee. The best way to get cash is with your ATM card. Italy does not run like clockwork so don't expect everything to go smoothly, especially if you're on a tight schedule. Leave some time for hanging out in a piazza or bar or going to a festival or special event you may stumble upon. Visitors to Italy often find that the most memorable part of their trip was something they didn't plan. Moving to a new city and new hotel every day is exhausting and eats up a lot of time that could be spent enjoying a place for several days and really getting to know it. While your big wheeled suitcase may be great in places with smooth walkways and hotels with elevators, in Italy you won't always find these things. Historic buildings may be remodeled to make beautiful accommodations but they often are not allowed to install an elevator. And unless you're staying at 5-star hotels, it's unlikely there will be someone to carry your bags. Uneven cobblestone streets make dragging a suitcase difficult and if you're going to Venice, chances are you'll be crossing bridges. If you're traveling by train, you'll need to lift your bag on and off the train yourself. Consider a lightweight bag (or two) that's easy to carry. While having a GPS for driving can be very helpful, it's not a good idea to rely only on the GPS. It's common in Italy to have several towns or villages (in different regions) with the same name. So take a look at your map and make sure you know which one you want. As in any big city, you should take precautions against having your money or passport stolen. Rome and Florence are the places that tourists most often report thefts of items like purses, cameras, passports, and money. Keep a close eye on your belongings, don't carry valuables in a pack on your back and avoid wearing expensive jewelry. Carry your passport in a place that's difficult for a pick-pocket to access and don't carry more cash in your purse or main wallet than you'll need for the day.